The predominant news in the Branch this week is rain. I have become fascinated with the channel 27’s weather map. The storms block out DirecTV, so I turn to the weather map and watch the red and yellow blobs moving slowly across the Franklin County line and into my little area of Owen. You can tell I lead an exciting life. Three elderly ladies got together on Mother’s Day and were talking about how much their sons loved them. Note: On May 3, my husband and I will be married 41 years. I’ve adapted this column from 2009. While out for our semi-regular Sunday drive, as I flipped through the radio stations I asked my husband what kind of music he liked. That’s the kind of questions you ask on a first date, not after 41 years of marriage! I’m not sure what that says about the state of our marriage. You don’t even know what kind of music your husband likes? Adult Bible study, youth Bible study and Rock Stars meet at 7 p.m. Wednesdays. The youth group meets at 5 p.m. Sundays. The next deacons’ meeting will be at 8 p.m. tonight (Wednesday). The men’s monthly fellowship will be at 8 a.m. Saturday, May 7. SPARTA – The Kentucky Manufactured Housing Institute (KMHI) is pleased to announce that Arielle M. Columbia, Sparta, has been named as a 2016 KMHI Scholarship Award recipient. Arielle received one of five $1,000 scholarship awarded in April to graduating high school seniors who currently reside in manufactured homes in Kentucky. Kentucky State Police (KSP) is partnering with the Drug Enforcement Agency (DEA) on April 30, 2016 in a collaborative effort to remove potentially dangerous controlled substances from home medicine cabinets. Collection activities will take place from 10 a.m. to 2 p.m. in every KSP Post area across the state. Another group of Owen County High School students are finishing up their first semester in college … during high school. OCHS offers the unique opportunity of an Early College Program through Jefferson Community and Technical College to students who wish to earn college credit at a fraction of the cost. Those enrolled ride a bus to the JCTC Carrollton campus a few days each week for morning classes, then return to OCHS for the rest of their high school classes. 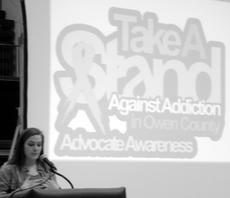 As part of the Take A Stand initiative, the Owen County High School student body attended an assembly on Thursday, April 14. The topic of substance abuse hit very close to home with senior Courtney Gullion, who lost a cousin to the pull of addiction and has extended family in recovery from substance abuse. Springtime brings warmer temperatures and more abundant rainfall, and it’s typically when many winged termites emerge inside homes and other structures.